Saarbrücken-Ensheim Airport A taxi ride from Saarbrücken Airport to Saarland University takes approximately 20 minutes. Bus #R10 runs hourly between the airport and Saarbücken Station. Luxembourg Airport Express busses operate between Luxemburg Station (“Gare Centrale”) and Saarbrücken Station (“Hauptbahnhof”). See timetable. German Railway to “Saarbrücken Hbf” (main station), travel time: 2,5h. Flixbus Travel time is approx. 3h. Paris Airport Well connected by TGV and ICE to Saarbrücken main station (“Saarbrücken Hbf”) without changing trains. Travel time is about 1h50 (see also below). The high-speed networks of ICE and TGV allow quick and comfortable travel to Saarbrücken station, for example from Frankfurt / Main or Paris Est (France). For more information and tickets see German Railway. The local main station is called “Saarbrücken Hbf”. Frequent busses and the Saarbahn (tram) make public transportation in the area a viable alternative to taxis. 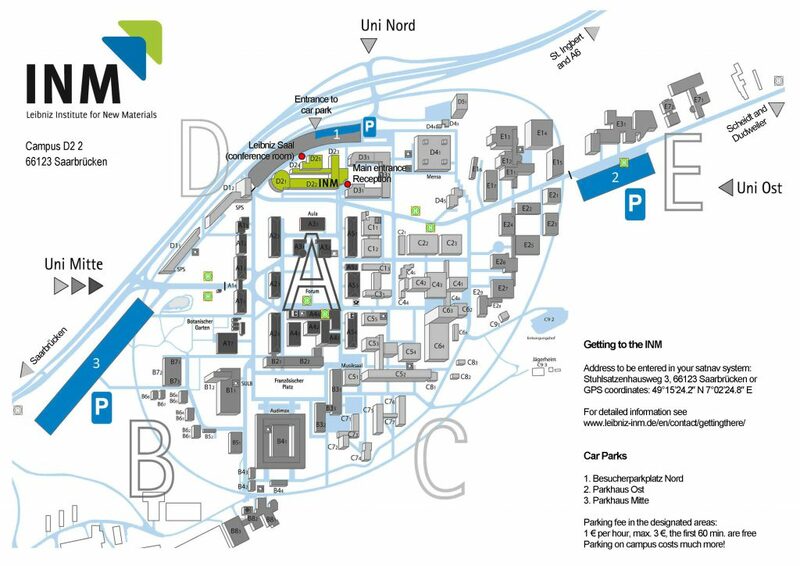 The bus stop closest to INM is called “Universität Campus”. The ride from the main station, the city center or from Römerkastell takes about 14-20 minutes. Tickets can be purchased either before the ride at ticket vending machines or directly from the bus driver. * No services running during semester break. Search for other bus stops and connections in the online timetable: www.saarfahrplan.de.